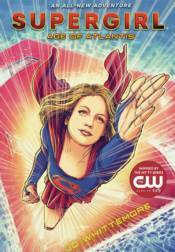 Soar into action in this all-new original adventure based on the hit CW TV series, Supergirl! Supergirl (aka Kara Danvers) has been running across average citizens performing amazing feats all over National City. But that's not even the weirdest thing going on. The Department of Extranormal Operations has captured a mysterious humanoid sea creature. Supergirl must find out what has drawn him to National City, and his connection to this surge of super-citizens. Written by celebrated author Jo Whittemore, this is one adventure fans of the TV series won't want to miss!